Ikea, like many other retailers, is in the process of phasing out incandescent bulbs, so these are a great compromise between the looks of an incandescent bulb and the energy efficiency of a halogen. Gunvor Fabric. $6.99/yd. Love the pattern. Grundtal bathroom mirror. $10. Sleek. Definitely looks more expensive than it is. 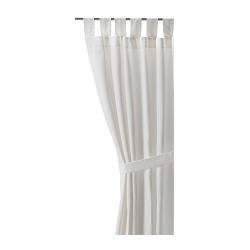 Lenda curtains. 2 panels for $14.99. I picked up several sets. More on these later. Check out the (almost) complete list of new items here, or sign up to get a free copy of the new catalog here. Be sure to flip to the one-day offers in the back -- there are some great deals! NICE deals. I must have one of those mirrors! We went to IKEA recently, always a fun trip (meatballs!). Love the fabric!